Irish Lentil Soup Recipes – Winter Warm and Healthy Food! Homemade Irish Lentil Soup Recipes. When I make this soup it always reminds me of when I was young. My mum would always make it during the winter. Everytime we had boiled gammon for dinner she would use the stock the ham was cooked in and leftover gammon to make it. Now I make it for my family. 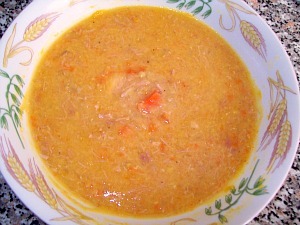 Try this Lentil and Ham Soup it is very tasty and filling. Made with split red lentils, carrots and gammon hHam. An easy and quick Healthy soup. Turn your leftovers into a heart warming Broth. Use red split lentils that just need to be rinsed or only soaked for 30 mintues. There’s nothing worse when you famcy making soup with lentils or other pulses and find that they need to be soaked overnight. I tend to make lentil and ham soup when we have gammon leftover from our previous day’s dinner just like my mum did. Making a healthy winter warm soup is a great way to use up the any leftover meat. If you don’t have leftovers, buy a couple of fresh gammon slices, one’s that are not highly processed. My mum use to say, if meat doesn't look like it's come straight from an animal… don’t buy it! Heat the olive oil in a large pot and add the finely chopped onion. Cook for a few minutes until softened and transparent. Pour in the stock. Partly cover and simmer until the carrots have softened slightly. Simmer until the lentils are soft and have swollen. Add the chopped gammon and stir it through the soup. Turn off the heat and let the soup cool slightly. Partly liquidize with a hand blender or luiquidize in batches using a worktop blender. My family like their lentil and ham soup partly chunky. Serve with crusty wholemeal french stick.